Live Shows / music / San Francisco / Words. Go Get Lost in this Elliott Smith Tribute. 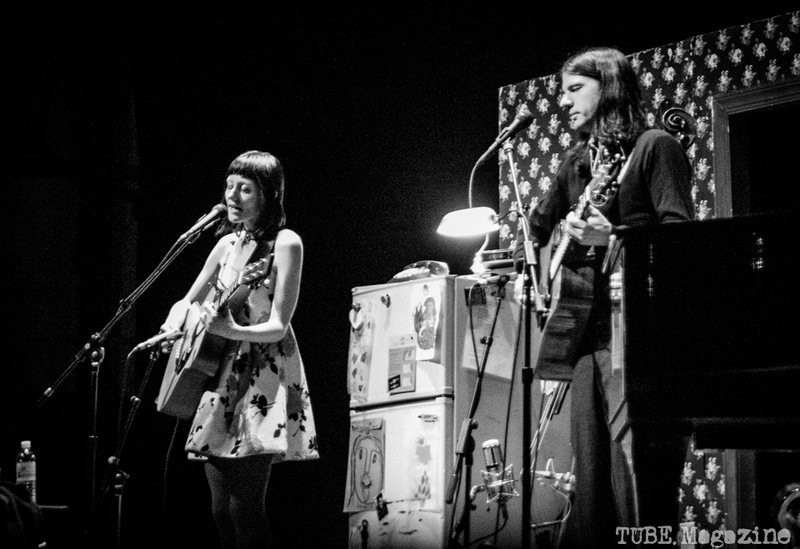 Jessica Lea Mayfield and Seth Avett on stage at Palace of Fine Arts, San Francisco CA, 2015. Photo Melissa Uroff. What began as an impromptu backstage duet has resulted in an incredible Elliott Smith cover album that breathes new life into the late musician’s work. In March, the album Seth Avett & Jessica Lea Mayfield Sing Elliott Smith was released after nearly three years of collaboration. 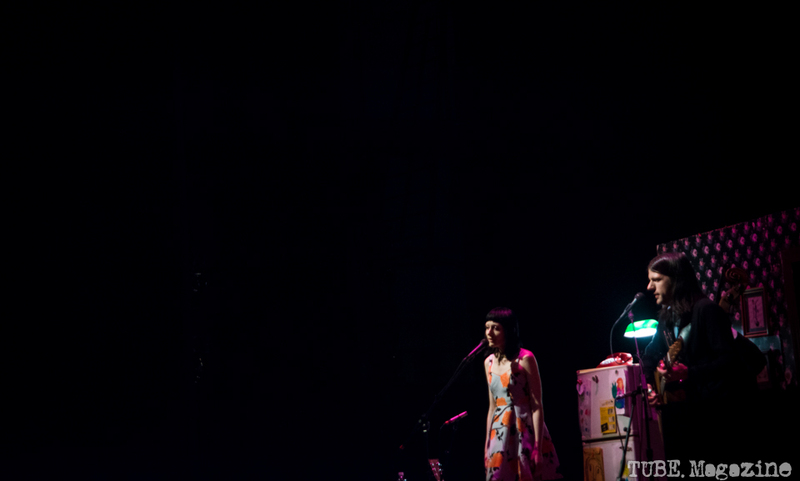 In 2011, Mayfield was opening for Avett’s band, The Avett Brothers. When he began playing Smith’s song Twilight on piano, Mayfield sang along. From there, this unique project was born. For the love of music, it is a good thing they did. The resulting 12-song album is a real tribute to Smith, who became a staple of ‘90s rock with his simple yet impactful lyrics that draw on love, pain, and addiction. He died in 2003 in an alleged suicide. With warm, harmonizing voices the duo brings heart to Smith’s moving words. They deliver the melancholy tone his songwriting begs for and if it was not so damn good, it could be too affecting. Which should be understandable to most Smith fans. On March 29, they stepped onstage at San Francisco’s Palace of Fine Arts accompanied by bassist Paul Defiglia to perform an outstanding set comprised mostly of Smith’s songs. It was their second-to-last night playing the songs together during a small, US tour in March. They switch on lead vocals as they do on the album, each fitting so well with Smith’s writing it is hard to have a preference. They also performed songs from Smith’s influences, including Bob Dylan’s Just Like a Woman and the Beatles’ I Will, as well as a few of their own originals. It can be intimidating, Mayfield, said, to cover the work of someone she holds in such high regard. “I just have so much love and respect for the music of Elliott Smith and every time I walk out it’s almost like, ‘Do I trust myself not to screw this up?’” Worries aside, she added she has just enjoyed the experience of performing with Avett and Defiglia. They do such justice to Smith’s work that anyone unfamiliar with the late, great songwriter could hear this new album and rest assured they are truly stepping into his heartfelt world. More information on the project is available here or visit them at www.sethandjessicasing.com. Tags: Avett, Avett and Defiglia, Avett and Mayfield, Avett and Mayfield behind the scenes, avett brothers, Defiglia, duet jessica and seth, Elliott Smith, Elliott Smith tour, Jessica Lea Mayfield, Jessica Lea Mayfield tour, Jessica Mayfield, Market Street San Francisco CA, Palace of Fine Arts, Palace of Fine Arts concert, Palace of Fine Arts San Francisco, Palace of Fine Arts Seth and Jessica, Palace of Fine Arts SF, San Francisco, San Francisco CA, Seth Avett, Seth Avett & Jessica Lea Mayfield sing Elliott Smith, Seth Avett & Jessica Lea Mayfield sing Elliott Smith tour, Seth Avett behind the scenes, Seth Avett music, Seth Avett new music, Seth Avett sings Elliott Smith. Bookmark the permalink. Previous post ← Trash Rock Turns One.